It is no secret that I have really struggled this year. Nothing has gone as planned and I have been left disorientated and lost as to where to go next. Truth be told I believed that I had reached bottom and that, while the New Year wouldn't make anything magically right (though if there is a fairy out there with magic to spare, please feel free to wave your wand in my direction), I thought it couldn't get worse. And then today I open a letter that tells me a 'friend' has passed away. I can't really say she was a friend as I'd never met her or even heard from her. But I have been writing to her for the past few years as she was a fellow M.E. sufferer, and I felt as though I almost knew her - after all, she was a part of my life. And now she isn't there, receiving my letters with a smile. Kelly died almost two months ago, but I didn't know until now (her mother didn't want to tell me before Christmas) so it feels like it has just happened - because it has just happened, to me. I know I am being selfish by saying that this is effecting me, and I can't imagine the pain her family and friends are in. But the truth is that it has affected me, though I am not yet sure how. This year has been bad, as I've said; and I believed it couldn't get worse, but this is just a reminder that things can always get worse. Nothing goes to plan and life goes on. I don't mean to ruin the New Year spirit (and I am still completely hopeful that next year will be better) but I needed to share this today, rather than the planned post on my words for 2013 (which I will now post tomorrow). I needed to put it into words, so that I can continue believing that the future is full of possibilities. So I can create a close on a very bad year, and make way for a Spring that I desperately need to arrive in my life. I don't know if next year will just bring more pain and loss. I don't know if anything in my life will ever go the way I dream it will. But I do know that I have no other choice than to believe that it will get better, as it's the only way I can face each day. I hope 2012 has been wonderful for you. And that if it hasn't (and if it has! ), that 2013 will be better and truly amazing. The future is uncertain. Life is uncertain. But we have to keep moving forward as life will change around us regardless of what we want. Perhaps by taking a step we can find ourselves looking on a brighter future. I'm not sure if I ever wrote here about my goal of reading 75 books this year. It isn't something I'd ever considered before, but due to being on Goodreads, I couldn't help noticing the Reading Challenges that people set themselves on there. And being who I am, I love setting goals and seeing my progress. 75 was kind of a random number, but I knew I wanted to read more than one book a week. As it turns out, I didn't even manage that (my current count is 49 books so far this year). However, I am not feeling bad about not reaching my goal. For a start, it isn't anything important, just something I was doing for fun. And secondly, I had no idea how many books on average I read a year so had nothing to base my goal on. Now I have a more realistic idea, I can set this year's challenge so that it's still challenging, but not so over-ambitious that it is impossible to complete. Basically, I'm saying that doing something with a goal in mind is enjoyable and motivational for me, but only as long as I know what I can and can't achieve, and whether or not it actually matters. There are things I had hoped to achieve this year that are now collecting dust. I haven't forgotten or abandoned them, it just turned out that this year was not the right time for them. But I am determined not to let that stop me dreaming and planning and doing (which, of course, is the most important part). I now know what my dreams were and what some of my new dreams are. Yet despite this, I have no idea where I'm heading. This year has been rough for me and I have a horrible suspicion that next year may be just as tough. I often wish I could simply give up but I guess that's not in me as no matter what, I always start to try again. This post, once again, went into a different place from what I had planned. But I'm kind of enjoying these rambles that start as one thing and then open into a whole other place within me. Writing this is as much for me as it is for you (actually, probably more so), and I hope it helps you to uncover who you are and what you think as you read what I'm discovering about myself. As you can probably guess from the title, I went shopping today. Where I now live is awkward to get to the shops (other than Tesco) with a wheelchair, so really I had to go while I am still at my parents. My sister pushed me around, and it was made extra fun by the fact that I now have no voice at all and was trying to let her know where I wanted to go in totally crowded places, but we got there in the end. It has been a long time since I've done a full shopping trip and already I am completely exhausted and expect it to catch up to me over the next few days. However, I have to admit that I really enjoyed it and got everything I wanted. A lot of what I bought was gifts for friends as I wasn't able to get them before Christmas. I also bought a few treats for myself including a cross-stitch magazine, 2 Lush bath products and a few sweets/chocolates with some of the money I got for Christmas. I also bought myself a few Christmas decorations, the most important being a white fairy-type ornament for my tree. Every year I try to get something special to add (if I'm not given anything) and when I saw this one at a random stall we stumbled across I knew I had to have it - and it being half price was just a bonus. I'm not really one to buy extra just because it's in the sale, but I do enjoy seeing what is for offer. Are you a sale shopper? What have you bought this year? It occurred to me this morning that my little brother (who is 5) is growing up in a completely different world than the one I did. I mean, he knows how to use the video and DVD player and knows about the internet and iplayer, even if he doesn't completely understand it. When I was growing up we had one family computer (actually, we got this when I was older than he is now, but I'm not sure exactly when) and had 4 hours a day of internet usage between us. This seems completely crazy now, but it wasn't that long ago. And we didn't expect more. My family has always been behind on technology (we've never had television and I got my first phone when I was 17 I think) and have always been book people. My little brother loves reading (and I've been really impressed with how far he's come) so I know that technology doesn't always equal the banishing of books. But I cannot comprehend how he will remember his childhood and what he accepts as normal. The world is changing so very fast and I want to be swept along with incredible knowledge and advances humanity is making; but I also want to stop and appreciate every moment and remember how the world is right now and where we started. In case you were wondering what brought on these thoughts, it was my little brother asking me a question. Okay, technically it wasn't the question, but his response when I didn't know the answer - 'I'll ask the family and if no one knows we'll Google it' (I don't think he remembered the question long enough to ask anyone else, but for someone who was brought up having to look everything up in one of my dad's many encyclopedias this response snapped me into realising just how much has changed). Okay, so I seem to have totally failed at blogging every day this month but I am determined to continue trying at the very least. I was going to do a post for each day with what I did and such but let's be honest, it probably wouldn't be that great to read as many of my thoughts have been lost by now. There were, however, a couple of highlights that I want to share with you (and as it's my blog I can do whatever I like, and if you don't like it, there are plenty of other websites for you to waste your time on). One of the things I noticed this year was just how hard it was to get something for my Christmas dinner. I am a vegetarian (and have been now for about 13 years) and so usually have a substitute for meat for big family dinners. A few years ago I had something wonderful; unfortunately I can't remember exactly what it was but I know it came from M & S - of course that means that every year I pay M & S a visit in the hopes that they will have something equally as great. Needless to say, they have never come through for me since. My parents checked Tesco and The Co-op but came back without anything suitable to go with a roast. So on Sunday my sister took me to Sainsbury's. There were two chilled nut roasts left, absolutely no frozen festive food left or the choice of a 'Quorn family roast' which I've had in the past and is literally a lump of protein that tastes of nothing. So I got one of the (very expensive) nut roasts. It was actually lovely and probably contributed to the over-eating I indulged in yesterday (I blame my brother and sister-in-law, Spud and Kess for making too much delicious food), though I still have quite a lot left as it wasn't a small portion. Anyway, if you are vegetarian or have any special diet requirements what do you do for big meals like Christmas dinner? Yesterday (Christmas day) was totally different from any of my previous Christmas' as my family spent the day at Spud and Kess' (it still feels strange to think that my brother has a wife!). I took plenty of photos and can't wait to get round to editing them. I have been getting into photography ever since their wedding. I do not intend to ever take it up as a serious hobby, nor do I really worry that I am choosing settings rather than working out my own (still a step up from just leaving it on auto though, right?) but am just enjoying taking, editing and having plenty of photos. If my photos weren't all in storage for the time being I would be trying to make sure everything goes into albums and I can't wait until I get the chance to sort them all (I think it's nice to have physical copies of photos as if they are on my computer they never actually get looked at). Anyway, I seem to have gone into a totally different direction than I was planning with this post. I was going to write all about how I have lost my voice today and just how important my voice is to me, but I realise that by writing this I have proved I clearly am not 'voiceless' and, as always, am so very appreciative of my ability to write - words are my life and will probably always be. Hope you all had a wonderful Christmas and are enjoying Boxing Day - do you have any traditions on this day, or do you just veg out like we do? It is currently Yule (21st-24th December). I am Pagan and therefore always recognize when Yule comes around, but I also celebrate Christmas. There are three main reasons for this. The first is that I was brought up celebrating Christmas and therefore it is part of my childhood, my traditions and who I am. The second is that the majority of the Western world celebrates Christmas (or at least appears to!) and it would be difficult to orchestrate my celebrations and gift-giving on the 21st when everyone else does on the 25th. And finally, it all boils down to the fact that I love Christmas. It is my favourite holiday - I love the decorations, the songs and general festivities. So, for now at least, I will continue celebrating Christmas, but always remember to put up some Yule decorations (such as evergreens) and simply appreciate the season. I went and saw my Nanny (my Dad's Mum) today and we went out for lunch. My Dad visits her twice every week, and so whenever I come back here, I go with him at least once. Of course, I will be seeing her on Christmas day as well. I asked her about what she remembers Christmas to be like. The main reason was just because I'm curious, and I love Christmas so am always ready to soak up any new information about it. But also, I think it's a shame that so many memories disappear as we age and pass, so knowing what she said will keep them alive a little bit longer. There were two main points she brought up. The first was that when she was very young she remembers that the 'sitting room' (or perhaps it's better to say a 'drawing room'?) was only ever used on Christmas. Just in case you're not familiar with the term 'sitting room', it is similar to a living room, but it is where the best furniture is kept and therefore only used on very special occasions I don't believe many (if any) people still have these types of rooms that are never used and many of the old houses have had that room converted into an extra bedroom (particularly in student accommodation) or a study. Anyway, my Nanny remembers that Christmas day was the only day in which their sitting room was used. She also said that she didn't really enjoy Christmas day that much as she was the only child in a room full of adults (who apparently went to sleep after the Christmas dinner). The second point was that she remembers Boxing day (the day after Christmas) to be what she actually looked forward to. They would visit her cousins and, especially during the way when both families had evacuees living with them, this meant that she could play with other children. I found this really interesting as I know that in some places Christmas Eve is full of the best celebrations, but I've never known Boxing day to register that highly for someone (except, of course, for servants when it was first introduced as it would be their day off). Have you ever asked relatives about their Christmas pasts? Please share anything about Christmas that you remember, or that you have been told. P.S. I also asked my Dad and he said he remembers his Day (my Grandad) dressing up as Father Christmas. This led to a bit of a discussion between him and my Nanny as she thinks it was one of my Grandad's brothers that usually did it. So I have put up my little Christmas tree that I have in my bedroom every year, and have decorated it with all my important decorations (I try to get at least one new one each year) - I am sure I will put up photos soon. The rest of the house is also slowly being transformed to Christmassiness (yes, that's a word now, I've decided!) with the big tree going up. So far it only has lights and tinsel on, and I am doing my best not to be a controlling perfectionist as my siblings decorate it. Also, I now have a chocolate Advent Calendar. Of course, as I only started it a few days ago, I am very far behind, but I'm sure I'll have caught up by Christmas! That's all for today, I can't believe there is less than a week til Christmas! As you can tell by the title, I have been busy, busy for the past couple of days and will no doubt suffer for it (actually, already suffering for it but dreading tomorrow much more). Yesterday I actually managed to go out in my electric scooter to post some Christmas cards. I definitely enjoyed getting out of the house by myself and it was worth having to spend the evening lying down - the only thing that was a problem was getting into the Newsagents/PO as it was one of those slope alongside the front of the shop kind of deals which meant a good few minutes maneuvering myself back and forth until eventually being able to get in. Today, however, I did even more. It started as a slow day though for some reason I woke up an hour earlier than my alarm and couldn't get back to sleep so just started getting on with my day. This afternoon I was picked up by my dad so I can spend Christmas with my family but this meant that I had to spend most of the morning packing - not so easy when half the stuff isn't reachable because of boxes are in the way. So basically I pretty much exhausted myself, even though I made sure to take plenty of breaks. I guess it doesn't really matter now as I am with my family and I have nothing much to worry about until after Christmas. I think plenty of rest is needed but I have a suspicion that the next week will be full of activity that I should probably try and avoid. However, I am determined to make it at least til Christmas day and simply suffer the consequences later (p.s. M.E. can you wait until after Jan 4th to attack please so I can enjoy New Year's and get to my doctors' appointments?). As for now, I plan to unwind with a book I have grabbed out of my old room, and then get plenty of sleep in the hopes that it will lessen the burden tomorrow. I seem to have missed blogging yesterday (day 16), but to be honest that kind of sums up how my day was. It wasn't bad or particularly good, it was just one of those days where nothing really gets done and you're not entirely sure what happened to the day; in essence it's a day that will be forgotten and for once I'm not that bothered. I used to want to remember every moment of every day and would write down in excruciating detail my days in my diary. I still keep a diary (rather sporadically at the moment if I'm honest) but now I tend to write down thoughts and ideas and feelings rather than events, unless something awesome happens or something particularly mundane feels worth mentioning (I can't help but imagine someone else reading them and so I like to keep it full of random tidbits that will show the future what today is like). Now it doesn't bother me that I don't detail exactly what I've done with my days, as I feel that mentioning little details here and there is much more telling that simply listing what I ate and where I went (or didn't go). Do you keep a diary, journal or scrapbook? Let me know in the comments. As it's very nearly Christmas now, I figured I had to do something Christmassy here on my blog so have answered a few random questions (from tags, etc) that I've spotted around the web - enjoy, and feel free to leave your answers in the comments. Yes, when I was younger I went carol singing round my village with the local Church every year. It was one of my favourite traditions as I love singing and it always got me in a very festive mood with having to dress up warm and stand under a lamp-post so we could see the words (though I very rarely needed them!). It always ended at a specific house where there would be hot mince pies and mulled wine waiting for us. What is you favourite Christmas song? Do you have any photos of you from when you were younger? 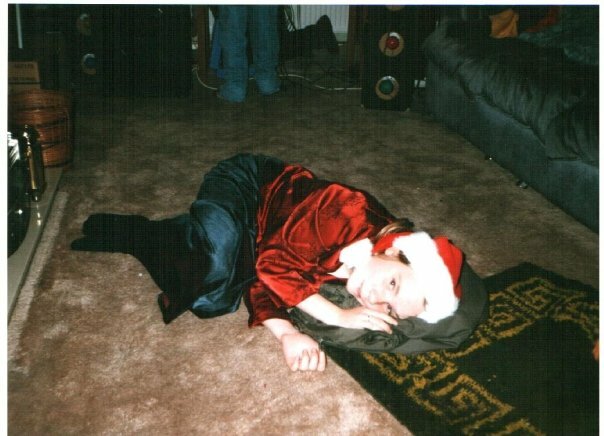 Yes, this is actually one of my favourite photos from my childhood though I don't actually remember it being taken (but I still have the hat). Kind of. When I was at Rangers (part of the Girl Guides) we put together those packs that come with all the pieces ready so you just stick them together and decorate. I say 'just' but it was actually really hard and took most of the evening; only two of us managed to complete our houses and I was one of them but it took me many, many attempts. It is one of my 'bucket list' goals to bake and make a gingerbread house from scratch (I had hoped it would be this year but with my health etc I guess I will have to wait another year to give it a go). Such a difficult question. To be honest I'm not entirely sure but I think it would be roasting chestnuts as it reminds me of a very specific stall that used to set up in my city when I was younger and that's all they sold - hot roasted chestnuts. I had my first taste of them at that stall and if I happen to stumble across it when out at Winter (very unusual as I don't live there anymore and I'm not entirely sure he was there over the past few years) I always buy myself some as a special treat. I would have to say seeing my family and friends as it's the one time of year that everyone makes that extra effort to catch up. After that would be giving gifts as I love coming up with the perfect idea and letting someone know I love them (which is why it is extra sucky that I probably won't be giving gifts this year). What do you have on top of your tree? My parents always put an angel on top of the tree (though I think she looks more like a fairy) but as I am not Christian I have a snowflake for the top of my tree which I used last year (I don't have a big tree this year) and will probably continue using for years, though I will say I have been tempted by a gingerbread man topper I saw online. Hope you enjoyed my answers and feel free to ask anything else. It probably goes without saying that I haven't been having the best time lately, as I haven't even been able to get on my laptop to update on Blogmas. However, it's not something I really want to get into, mainly because I know it will turn into a rant about uninformed, insensitive, and rude doctors, and I know no one needs an extra rant right now, so I will do my best to refrain. I had hoped that I would only miss a day or two and then update with something extra Christmassy with Q & A about Christmas-related things, but I don't know if I can actually sit up long enough to do that just yet (for those of you who may be feeling worried about me, I appreciate your concern and want you to know that I'm doing a little better every day with plenty of rest, so please don't burden yourself with more worry than you need to). So for now I will just answer one question I've seen floating about and have really wanted to answer every time I see it. What Christmas film would you most like to live in? For me, it has to be the Grinch. Not because I particularly care about the Grinch or anyone specific, but because I just know I would love to live in Christmas-obsessed Who-ville and think I would totally fit in there. As it happens, the past few days have left me feeling quite un-Christmassy as it has meant that I haven't the energy/ability to put up any Christmas decorations (at least I am going to my parents next week so know I can look forward to those ones) and that I now don't expect to have any (okay, maybe one) gifts ready to give - but I figure being able to spend Christmas with my family is more important anyway - and, of course, that means that next year I will give extra care to all gifts, and I'm going to start in January (for once I am 99% sure that this isn't an overstatement). Hope you are all well and looking forward to Christmas. Let me know in the comments what your favourite decorations are. Today pretty much blew, but honestly I don't want to talk about it. Other than to say it did mean that I watched a couple of Christmas films on the Christmas 24 channel. I've only had television once before (my second year at Uni) so I'm still finding it a bit of a novelty; but honestly, I am using it more as a distraction than for enjoyment most of the time. If you're wildly curious, I'm mainly watching: My Family, Two and a Half Men (a LOT of this) and Fairly Odd Parents (and the odd episode of Rugrats), and of course the Christmas films. Yesterday I did actually watch a few episodes of something that truly amazed me - One Foot In The Grave. But I didn't watch on TV; my housemate was watching his DVDs of it and I kind of got sucked in. While I didn't find it completely amusing, I did find the writing truly incredible. Only two other shows have ever made me stop and recognize that they are so well written, that I wish I could write something remotely as good (they are Doctor Who and Dollhouse), so it's not a stretch to say it blew my mind. And that is one good thing about having television I guess, plenty of access to writing, both good and bad and the stuff in between (which is the majority), but it's just as easy to watch a DVD, read a book or go online to find inspiration, and there is a lot higher chance of being able to control what and when, when you're not tied to a TV schedule (yes, I know there is record and pause and rewind and all that stuff, but it's still controlling). So I guess I'll continue to absorb it while I'm eating or downstairs and unable to get upstairs (I am going to hook it up in my room as well, but I expect I'll only be watching it for the films as I love watching new and old ones (I wouldn't consider myself a film geek yet, perhaps just a film amateur). What do you like to watch (if you watch television)? Anything I'm missing out on? Sorry that this post is going up a little late, but last night I was so shattered that I just collapsed into bed and fell asleep. The reason being that I had quite a good day and so did probably a little more than I should have (I moved some boxes ready to put up my little Christmas tree and helped to change my bedding) with plenty of resting in between. I finished the day off by watching my favourite Christmas TV special which is 'How I Met Your Mother' Season 2 - 'When Lily Stole Christmas'. I just love all the decorations in that episode and am certain that watching it at Christmas is going to become a tradition for me, and it was the perfect way to end my Sunday evening. Unfortunately today (Day 10) seems to be turning into a pretty awful day (not just health-wise, but in general things going wrong) but I am still determined to make something of it and will update you all this evening. Today, once again, I have spent the majority of my time resting. However, I also managed to get quite a bit of my paperwork sorted (to do with moving and benefits and my disability, etc) which I'm quite pleased about as knowing I still hadn't done it was causing me a lot of stress and stress is very, very bad, especially if you have a chronic disability. I still have some left to do and have made a to-do list. I've done the old kind where I literally write everything important that I can think of on it, but I am finding this to not be as stressful as I thought it would be as I'm not putting pressure on myself to get things done at a certain time (unless there's a deadline) and I don't have to be constantly worrying if I've forgotten about something (if I have, I just add it when I remember it). I've always been a list person, though earlier this year I was trying to do the one thing a day lists instead, I've found that I work better having everything I have to do written down and just choose one thing each day from the list that I aim to get done, at the very least, that day. That way I get the best of both worlds and I can work on how I'm doing - if I'm having a particularly bad day I just scratch the list completely and rest instead. Do you like to make lists or do you have your own productivity system? And today, after one of my long rests, I got up and suddenly felt Christmassy. I think it's late coming for me but so excited about it now (I just wish I'd been more organised, but I guess there is always next year - and I think I say that every year). 17 days til Christmas! So sorry that I didn't write yesterday, though to be completely honest it is unlikely I would have found anything remotely positive to say as I am currently having an incredibly bad crash health wise, and yesterday was only second to the time I ended up in hospital. So basically I haven't really been doing anything other than lying down and watching my candle burn while I rest. I am currently burning a vanilla, cinnamon & cranberry candle (the scents change as you burn through it) but have to say that my favourite candle this year is the mint chocolate cookie one by Aunt Bessie (I purchased both of these candles at the 99p store) as the scent is simultaneously sweet and fresh, and it literally fills large spaces with the scent instantly when it is burned. I wish I had something exciting or remotely interesting to write about, but right now I am just concentrating on resting and trying not to do more than is necessary to keep the worst of my depression at bay, in the hopes that in a few days I will be back to normal and can get started on putting up my Christmas decorations and making Christmas gifts (I know I'm leaving it late, but as I've said before, December kind of crept up on me this year). Hope you are all having a much better time than me right now, and there's only 18 days til Christmas! Labels: Blogmas, Thoughts on Living With M.E./C.F.S. This morning I woke up as always, went downstairs to get my breakfast and then, as I glanced out the window I got a shock - we had snow. It wasn't snowing (in fact it was sunny all day) but it had overnight so had a decent lay over everything. I would have taken a photo but for some reason my camera battery charger wasn't with my camera stuff (my fault, I'm sure) so I won't be taking any photos until I can find that. Anyway, I was totally surprised by the snow as it's been sunny the past few days (yesterday was actually relatively warm as I managed to go out so it's one of the days I can vouch for); but I guess it explains why I woke up in the middle of the night freezing cold (thankfully not for very long). So I had a pretty good morning actually and managed to have my hair washed, but then this afternoon the pain started to catch up to me so I've spent the majority of the day resting and trying to feel okay about that. It did mean that I could eat without help (though I still had someone help to prepare the food for me). But now I'm all dosed up and waiting for them to kick in so I can go to sleep. I'm planning on an early night, maybe with watching an episode of Buffy as I can do that lying down. If you had snow I hope you were safe and enjoyed it (I'll admit I don't have any sympathy for people who complain in England as even when it's 'heavy' snow, it really isn't most of the time). Let me know in the comments what you like to do on a snow day and, still, if you have any questions for me. I'll admit I almost forgot to post today (it is now 10:40pm and I am getting ready for bed) as I have spent most of this evening resting - the full-on kind where I just lie down and watch my candle burn for a few hours, to allow my body to recuperate. The reason for this is that I had an exceptionally good morning, despite getting up late and being groggy until I'd had my morning coffee (the only cup of coffee I have almost every day). I managed to do some crafting and went out on my scooter (did I tell you I have an electric scooter now?) to Tesco to stock up on a few more microwave-friendly meals (as the team of 'carers' are not allowed to use the oven - health and safety gone mad) for those days when I can't even cook part of a meal. I am still listening to Christmas music, and hearing it playing in Tesco definitely helped me feel a little more Christmassy. I thought of watching The Grinch (the Jim Carrey version) as it is my favourite Christmas film, but due to having to rest I didn't even check to see if I have unpacked it yet, so I guess it will have to wait for another day. I am also thinking about Christmas gifts. I am very into handmade gifts and have a few ideas for this year, but obviously it is too late to do anything too amazing. However, I'm hoping that if I continue to have fairly good days (or fairly good mornings, anyway), I will get my arse in gear and get on with them. 22 days to go til Christmas! I overdid it yesterday with trying to unpack a box (so I can actually put my Christmassy decorations up) and half preparing dinner. So that means that today I have pretty much done nothing other than lots and lots and lots of resting and watching a couple of videos on YouTube. I wish I had something more exciting to tell you about, but honestly my life is pretty drab at the minute but every day is a chance to make it to a better tomorrow. I'm still not really feeling that Christmassy which I think is largely due to the fact that I haven't got any decorations up yet and nor have I started any advent things as they are all in the box with the Christmas decs and I'm not quite up to getting it off the wardrobe and putting it back, just yet. I am excited about them though as this year I have the one I use every year which is a 2D stable which comes with a book with something to add each day and read the matching part of the story (I am no longer Christian but my Dad gave this to me years ago and it's kind of a tradition to use it now); but I also have 2 advent calenders that were created via Swap-Bot - one with 24 Christmas cards to open, and one with 24 letters to read (which is what I'm most excited about). I know I really enjoyed creating the six cards and letters for my partners (4 partners, 6 items to each) so can't wait to open and see what is in store for me. That's pretty much all I have to say today. I am thinking of doing a Q & A sometime next week so please ask me questions in the comments (or tweet them to @Tamara_Epps) about anything and everything so I have something to answer. As it has been so incredibly long since I have blogged, I figured I should probably let you know what has been happening in my life. Firstly, and the biggest, is that I have moved. I only moved a few weeks ago so I am still unpacking and getting used to life in a house again as I am now renting a room from some friends. I am enjoying being able to see and hear birds again, living with cats (they have 6 cats which is a major difference for me as the only pets I've ever had were mice), and knowing that I am responsible for myself and can't rely on someone else in the same way that Chris was for me even after we broke up. It is a huge change and one I am still learning to accept. I now have an electric scooter which I have used a couple of times and will use again once I can find an extension lead long enough to charge it. I am determined to be as independent as I can be, though am currently having carers come and help me out on a daily basis - something I will no doubt talk about at another time. So yeah, that's my big change (and of course, now being single) and everything in my life is kind of effected by it. However, I am determined to try and stay somewhat optimistic, and see this is a stepping stone towards the life I will love and enjoy. That's one of the reasons I haven't really written much over the past few months as I have been depressed and physically struggling with my body, my emotions and my mind. But I have made the step of moving on and now am hoping that I can start sorting my life out. I must say though, they really could have warned us in school or college just how hard life is on a daily basis (and this isn't just my opinion) but then again, perhaps they didn't want us all to hang ourselves at the prospect of a life without money or... well, whatever else it is we lack (for me that would be health). End of rant. Seriously though, I am doing better and just remembering to take it one day at a time. Let me know if you know how hard life can be or if your life is wonderful right now as I know that would cheer me up. I can't believe it is December already. And I can't believe just how many months have gone by without me blogging (I'm not even going to count as it just makes me sad). The truth is I love blogging and always knew I would come back, though I'll admit that I did consider not coming back to this blog (I even wrote the farewell post but then changed my mind). Anyway, as I have been struggling to get back into blogging (and everything else in my life) with all the changes that have happened to me over the past 6 months, I have decided that I am going to blog every day this December which will force me to get on and write something (or at least post something!). Last year I watched a few 'Blogmas' videos which are basically the same idea but in vlog form, and I will be watching quite a few this year as well, but I don't know whether to follow suit and call this Blogmas or Blogvent - please let me know which you prefer. Perhaps this can become an annual thing as I love Christmas and December and New Year's so am looking forward to what this month will bring. Not every post will be about the holidays but I will warn you that if you aren't a Christmas-obsessed person then you might want to steer clear from this blog for the next month! Guess I should now start thinking of some things that I can write about and let me know if you plan on joining in so I can read your blogs as well. These are the words that have been knocking about my brain for the past few days. And I am beginning to realise that these might possibly be the most important words in the English language (alongside Trust). When I shift my focus to soaking in these words and allowing their abundance to be felt deep inside of me, I become more than me I am a golden shimmering version of me – the me I am supposed to be. When I entrench every part of my life in these words, life becomes more magical than I could ever have imagined. It is still hard and painful and difficult. But it is also easy and safe and beautiful. I am lifted out of the everyday monotony of dealing with my disability and exist as I was meant to, my essence shining through. And I know that my future will be amazing. And that I will achieve what I am meant to achieve. And that I can share these beautiful feelings with the world. There will never be a shortage of them and so I want to let them flow out of me and into every person I meet, every person whose words I read, every person who I know needs to feel them, every person in the universe. I have Love, Hope, Joy and Peace. I feel Love, Hope, Joy and Peace. I give Love, Hope, Joy and Peace. I am Love, Hope, Joy and Peace. I still don't have the words to write, despite feeling like I want to start writing again, but I do have the pictures. Not a day goes past without me thinking about blogging. I have been blogging now for a few years and I still love it - in fact, I would say I love it more now than I ever have before. So why haven't I been posting recently? Because I don't have the words. Or the pictures. Everyday I think about writing here and almost everyday I struggle to find anything I want to say. Right now in my life I am in a very introspective place. I am spending time with my crafts and my thoughts and my feelings. I am allowing silence to fill me so I may know the direction I am going and if it's where I want to be. I want to share all of this here, but I feel that sharing too soon will cause a rift. And so I sit alone, behind my screen, in front of a book, with a pen and paper. I sit and try to be. I sit and try to find out anything about myself that can help me. I want to let you know that I am not abandoning my blogging or projects or ideas. But I am at living in a state that needs to not have every detail and thought shared with the world. I don't know when I will be ready to share, if ever. But I do know that blogging will be a part of my future, as much as it is a part of my present. Basically - I will return! I know it can be frustrating for bloggers to post erratically, but that is what I need to do right now. If you find it difficult to cope with knowing that posts may be a bit here, there and everywhere from me for a while, go and find someone you can depend on to follow. If not, I hope you will enjoy the odd post that makes it to your screen from me.